Lausanne (SUI), 5 January 2016 – Venezuelan Jumping athlete Andres Rodriguez, individual silver medallist at the 2015 Pan-American Games, has died in hospital of injuries sustained in a car crash in Wellington, Florida (USA) on 4 January. He was 31. A passenger in the car, Sophie Walker (30), died at the scene of the crash. Ms Walker was a talented amateur rider on the US national circuit. Andres Rodriguez’s career highlight came at the 2015 Pan-American Games in Toronto (CAN) when he rode Darlon Van Groenhove to individual silver. He twice represented Venezuela at world championship level, at the Alltech FEI World Equestrian Games™ 2010 in Lexington, Kentucky (USA) and the 2014 Games in Normandy (FRA). His first major success came in 1996 when he won the FEI Children’s Jumping Final. He went on to claim team gold and individual silver at the 2013 Bolivarian Games in Lima (PER), team gold at the 2010 Central American & Caribbean Games in Mayaguez (PUR), and individual gold at the South American Games in Medellin (COL) the same year. The talented Jumping athlete was bidding to make his Olympic debut at Rio 2016, and was also hoping to make his first appearance at the CHIO in Aachen (GER) this year. He had already realised his goal of a place in the world top 50, and was in 41st on the Longines Rankings. Born in Venezuela, he moved to Europe after graduating from high school to train with Nelson and Rodrigo Pessoa. More recently, he was based in Paris (FRA) for the summer season and in Florida (USA) for the winter, where he was trained by Irish Jumping legend Eddie Macken. He married his long-term partner Clementine Goutal last month. The FEI extends its sincere condolences to the family and many friends of Andres Rodriguez, to the Venezuelan Equestrian Federation and the global Jumping community. Toronto, Canada (July 15, 2015) – Premier Equestrian, maker of world-class dressage arenas, arena footing, and horse jumps, was thrilled to watch the U.S. Dressage Team take the 2015 Pan American Games by storm. The company was especially excited to cheer on Steffen Peters and Laura Graves, who use Premier’s products and have been dubbed “Premier Equestrians” by the company. After helping the U.S. to Team Gold, Peters earned the Individual Gold medal and Graves took home Individual Silver. The Team Gold medal, earned with a team total score of 460.506, guarantees the U.S. a spot in the 2016 Olympic Games in Rio. The revolutionary design of the Brentina Arena solves problems previously associated with multi-rail arenas. “The 18 inch base cone is extremely stable in high wind and the rails snap into each base to release upon any force or impact, thus providing safety for horse and rider,” Rustad explains. Laura Graves, Silver medalist in Tuesday’s Freestyle competition, trained in preparation for the Pan American Games under McDonald at Rivergrove Farm in Hailey, Idaho. 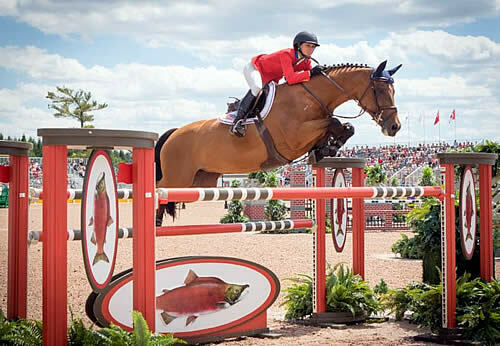 Graves, a self-proclaimed underdog with what is shaping up to be a “fairytale” story according to CNN, has had a journey to international success that has caught the eyes of many equestrian enthusiasts. She and her Dutch Warmblood Verdades (Florett AS- Liwilarda, Goya), known as “Diddy,” have captured the hearts and the attention of spectators around the world. Purchased in The Netherlands, based solely on a video, Diddy arrived as a fiery and “explosive” six-month-old. The now thirteen-year-old Diddy grew up on the Graves’ family farm in Vermont, and then moved with Graves to Geneva, Florida, where the duo began their dressage career. USA claimed the Team Gold medal on Sunday, and finished out the Pan American Games with red, white, and blue leading the scoreboard. Peters brought his best to the show ring for the Intermediate I Grand Prix Freestyle, on his mount, Legolas 92, scoring a 80.075 percent to earn first, with Graves and Verdades following at a 79.825 percent. Premier Equestrian proclaimed “a big congratulations to team USA for their win, and to our Premier Equestrians, Steffen Peters and Laura Graves!” Premier Equestrians are riders who have demonstrated sportsmanship, generated awareness for horse sports, or have been outstanding in his or her contribution to equestrian culture. Premier Equestrian’s world-renowned expert arena footing, dressage arenas, and revolutionized horse jumps are crafted and designed to be perfect for riders of any level. Learn more about the company and its outstanding Premier Equestrians at www.PremierEquestrian.com.